Experience a Park City paradise at this beautifully remodeled studio. Located in the Prospector Square Lodge, adjacent to Park City's historic Rail Trail perfect for running, biking, walking and cross-country skiing, this vacation rental offers access to a resort pool, hot tub, fitness center, spa, and more. The studio features a private balcony, cathedral ceilings, stylish decor, and a woodsy alpine feel - ideal for your next ski retreat, romantic couple’s getaway, or 4-person family holiday. What could be better than coming home to a lavish and homey studio after a day on the mountain? Nothing - except maybe making your way to the community hot tub to soak your sore post-skiing muscles. At this vacation rental condo, you can do both! Snuggle under the queen bed's covers and furry blanket while watching a movie on the flat-screen cable TV as the fire crackles in front of you. You'll love being surrounded by the studio's appealing furnishings, which consist of a gorgeous wood-paneled wall, cathedral ceiling, and appropriate mountain decor reflecting the Park City area. Use the well-equipped kitchenette to prepare filling breakfasts before hitting the slopes. A stove, microwave, refrigerator, and coffee maker will ensure you can easily whip up some scrambled eggs, store a few beers and other cold beverages, and even cook some homemade meals for a cozy night in! When you aren't lounging by the community pool, getting active in the fitness center, or replenishing your energy at the spa, unwind on your private balcony. Complete with 2 cushioned wicker chairs and a rustic wooden railing, simply slip through the sliding glass doors to sip a glass of wine or cup of tea in the fresh Utah air! 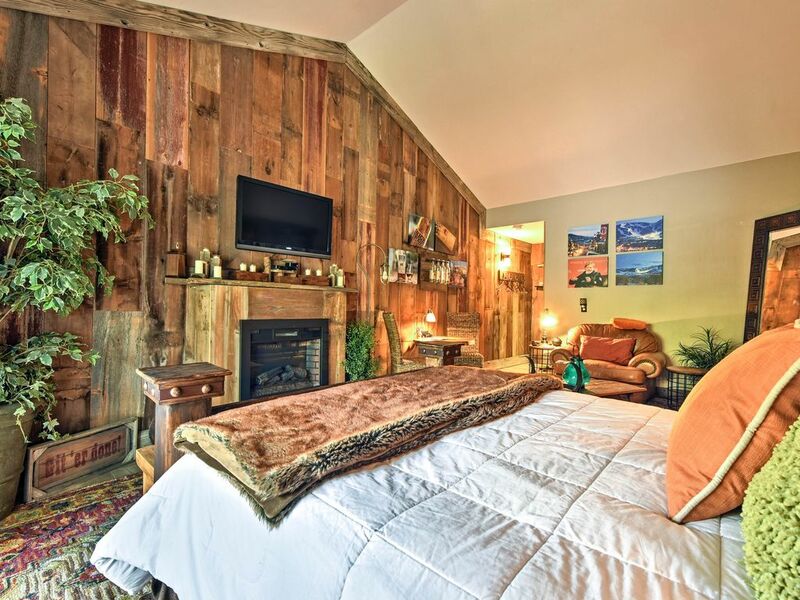 This mountain town retreat in the Prospector Square Lodge is centrally located for all Park City has to offer! Utilize the Silver Mountain Sports Club & Spa, right next door to the Prospector, if you want to work out or treat yourself to a massage. Walk to a variety of delicious restaurants and shops in the downtown area or hop on the free public shuttle, which stops right outside the property. You'll love strolling down the city's historic main street, with charming 19-century buildings reminiscent of the area's origin as a mining town. Visit Utah's first distillery since the 1800s, High West Distillery; it's only a 6-minute Uber ride from the studio if you want to drink a cocktail or two! Situated just 1.5 miles from Park City Mountain Resort, this vacation rental studio is unbeatable for ski trips. You definitely won't get bored while nestled high in the Wasatch Mountains with 7,300 acres of almost 350 trails to explore. In addition to one of the country's most notable ski resorts, Deer Valley Resort is a second ski mountain flanking the city on the other side, just under 3 miles from the property! The world-renowned Sundance Film Festival takes place in the city every January, if you're lucky enough to be vacationing at that time! For summer travelers, never fear - you'll be enticed in the warmer months with hiking, mountain biking, fly fishing, golfing, and activities at the famous Utah Olympic Park, just 15 minutes away. Lovely, Cozy, and Welcoming. Just Perfect! Clean, comfortable, and welcoming, the studio was absolutely perfect! The kitchen is equipped with a Keurig machine, so make sure to buy Keurig cups if you want coffee! I would certainly check in and take inventory on what you will need (paper towels, dish soap, Keurig cups...) I think we were lucky with some items left over from the previous guests. Take advantage of the Bus system (download their app). The bus stop is right outside of this unit on the street, it was wonderful. 10/10 would stay in this unit again. Owner needs to pay attention to schedule of when guests are arriving and how many. When I booked, I wasn't informed check-in wasn't until 4. We arrived at 1:30 and asked if we could check in. They said condo wasn't ready and I couldn't check in until 4. We went grocery shopping and came back at 4. Checked in. Brought all of our luggage and groceries only to find the unit had not been cleaned. Dirty sheets piled up on bed. Dirty towels all over the floor and garbage over flowing cans. I called owner. They said they would come clean. We had to leave all our stuff piled in a corner of an extremely small unit, then go find something to do while they cleaned our unit. Then when we get back to the unit, we find that there are only to wash cloths in the whole unit. They knew very well we had 3 guys staying in the unit. I called the owner again. Her reply was "There's 2 wash cloths. There are also some hand towels. We will get some more out there." Which did not happen until the middle of the next day! That's VERY poor service! Also, ad for unit talks about cooking breakfast in unit before hitting the slopes. So while we were grocery shopping waiting for unit to be cleaned, we bought biscuits along with other breakfast foods. Only to get inside the unit and find out that there is no oven! And be forewarned... don't buy too much food. The refrigerator is a VERY small dorm style refrigerator! Oh, and there's no place on the whole complex to do any laundry. I've used VRBO many times before and have always been very happy with all the other places. But I definitely would not recommend this place!